Over the past couple of years Comixology has slowly become a growing home for original comics, beyond the oodles of digital series it already sells from other publishers like Marvel and DC. 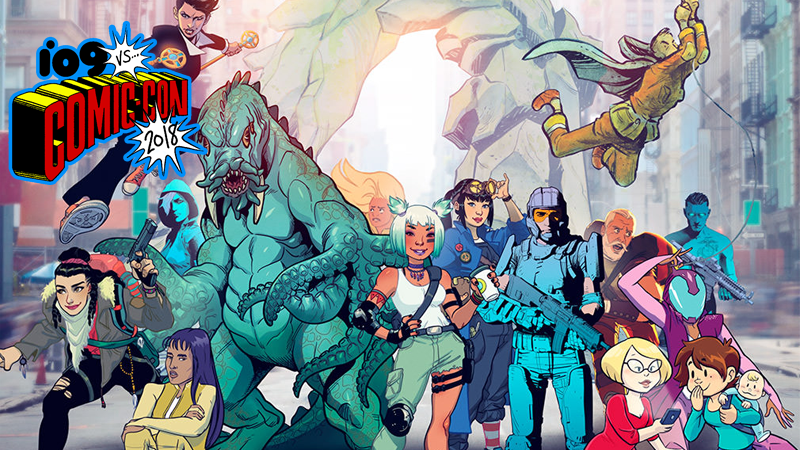 Earlier this year it announced a new line of creator-owned orignal series under the Comixology Originals banner, and now even more are on the way. Revealed during Comixology’s panel at Comic-Con this afternoon, seven new series will be launching under the originals banner—four of which are available on the service from today. The four Comixology Originals available on the service from today. Those four include: Goliath Girls by Sam Humphries and Alti Firmansyah, about three orphans raising a young kaiju who could hold the key to ending the monster war consuming the world; Grave Danger by Tim Seeley and Mike Norton, about a secret agent who fights supernatural crime; Hit Reblog: Comics That Caught Fire by Megan Kearney and others, highlighting the stories and creators behind viral webcomics; and Teenage Wasteland by Magdalene Visaggio and Jen Vaughn, about jerkass young teenagers who are actually the secret defenders of the Earth. Truly, something for everyone, especially if you like cool-sounding things like kaiju and supernatural crime! Delver, The Stone King, and The Dark will be available “in the coming months,” according to Comixology. Beyond the latest roster of originals, three more titles were revealed at the panel: C. Spike Trotman, MK Reed, and Tish Doolin’s Delver, a five-part miniseries about a young woman who finds herself becoming a professional dungeon explorer when a living cavern of creatures opens up underneath her small village; Kel McDonald and Tyler Crook’s The Stone King, a fantasy miniseries about a young thief who encounters the titular giant; and Mark Sable and Kristian Donaldson’s The Dark, a graphic novel about a future earth where cyberwar has destroyed all technology, leading to the rise of a sinister, biologically-based internet that wants all of humanity to join it, whether humanity wants to or not. It’s a major push for Comixology’s attempt to re-envision itself as a home for creator-owned comics as well as a storefront for, well, basically every other digital comic you can think of. But if that push means more interesting series like the ones above, then we certainly hope it pans out.